We are the best Drupal development company in Bihar. It is a type of CMS website development service that yields a faster outcome, with confidentiality, safety, reliability & flexibility. The type of application being included in it is Drupal Content Management System (CMS) development, Portal development; shopping cart, forum, auction, review, media, community, corporate & social networking websites; and also apt for ecommerce dealings & apps. It is considered to be the best CMS development applications as it is highly cost effective in nature with timely CMS website solutions. As per the knowledge needs & prerequisites as well as the updates, it is essential that developers need to actively participate in the community of Drupal. Drupal modules are created in a tailor made manner by the skilled pool of experienced team mates yielding high performance solutions & play a vital role in the development of multi-user text, copywriting & editing processes yielding top quality result oriented committed SEO & user friendly scalable solutions efficiently in a different way at a measurable & affordable prices. It is flexible, easily integrated with third party application, powerful SEO functionalities with proper management of Meta tag, page title, custom content types & views, updated URL control & taxonomy traits, benchmarking support, easily manageable, usable & scalable in nature with growing customer base. It believes in building websites of dynamic nature that confer a content user experience. 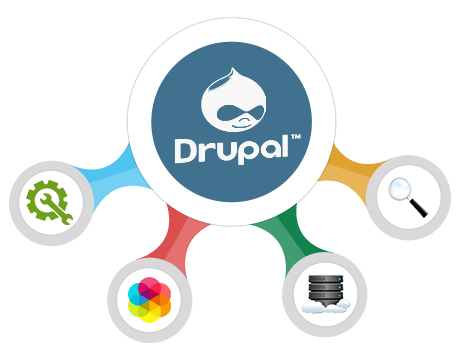 It provides all types of Drupal development services ranging from personal websites to corporate websites or portals and blogs to enterprise 2.0 oriented collaborations & knowledge system. It makes use of programming language called as PHP termed as Hypertext Preprocessor. It provides one stop web solution services that are composed of custom content listings & content types, image galleries, WYSIWYG editors, integration tools of 3rd party and many more. It provides tools needed for various actions, control restraints like IP addresses email, uses roles as well as helps to extend & flourish the use of website comprising of safety updates declaration. It has a very significant trait of allocating the URLs which are descriptive & suggestive in nature. Computing system taking into account the applications for instance PHP & MySQL can easily install Drupal that is elaborated in regard to CMS architectural framework.